The LCMS Ministry to the Armed Forces supports almost 200 chaplains, who represent the church on active duty, the reserves, the National Guard, and Civil Air Patrol. Chaplains meet the needs of military personnel and their families. We care deeply for those men and women who currently serve in our armed forces and they are in our prayers. But for those pastors who have put on the uniform of our military, and for those who served our nation and live in our communities, there is deep gratitude. Then the King will say to those on his right, ‘Come, you who are blessed by my Father, inherit the kingdom prepared for you from the foundation of the world. For I was hungry and you gave me food, I was thirsty and you gave me drink, I was a stranger and you welcomed me, I was naked and you clothed me, I was sick and you visited me, I was in prison and you came to me.’ Then the righteous will answer him, saying, ‘Lord, when did we see you hungry and feed you, or thirsty and give you drink? … And the King will answer them, ‘Truly, I say to you, as you did it to one of the least of these my brothers, you did it to me.’ Matthew 25:34–40. This passage of Scripture gives us a vivid picture of what Jesus wants our mission work to look like. Indeed many of our LWML Mission Grants help fund programs that address the issues of hunger and poverty. Sadly, hunger is a growing problem in the United States. According to www.feedingamerica.org, in 2015, 42.2 million Americans lived in food-insecure households, including 29.1 million adults and 13.1 million children. The first and foremost action we should carry out is to give all praise and glory to God for the tremendous favor He bestowed on us allowing us to fulfill our pledge to the 19 grant recipients with full payments to them. Most of us have been Christians all our lives, baptized as infants. It is difficult to imagine never having heard the message of the gospel. We sometimes take for granted the blessings of a church home and a childhood filled with Sunday school and VBS lessons, songs, games, and crafts. Now imagine, if you can, that you have never heard of Jesus. Many children have not. They live in the poorest slums of India, refugee camps in Lebanon, and poverty stricken areas of the United States. Some are hungry every day, or homeless, or living in a home stricken with alcoholism or abuse. These children of God need our help. To provide scholarships for young Lutheran adults that have been selected as volunteers to serve in areas in which their talents and services are needed (poverty/inner city areas, and areas of disadvantage and/or long-term recovery). LCMS Young Adult Corps members are especially trained to live and work and be identified with the people in the community, using their skills and understanding to serve these people in relation to their needs and to the skills and resources available, always being Christ’s witness in acts of mercy for the church and the world. 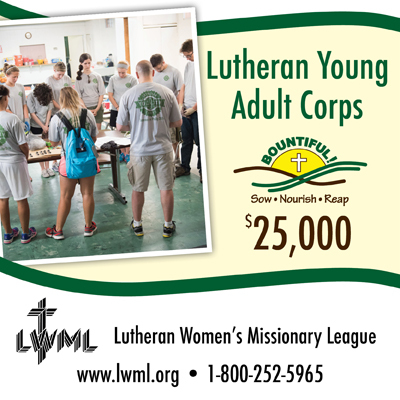 Long-term service opportunities, suited for youth who after high school or college have not yet settled on a vocation, are offered by Lutheran Mercy Youth Corps. Host sites will provide opportunities to serve neighbor and community in a volunteer service. Living in a community with other youth, they will have daily devotions, connections to a nearby church for Word and Sacrament ministry, and theological training before the youth are sent out on a mercy project such as domestic work in the inner-city or other underserved areas. Each participant will provide a portion of the stipend dispersals with LWML grant money supplementing the funds as scholarships.